OnePlus announced a series of permanent price cuts today for all of its smartphones. Even if you bought your OnePlus handset two weeks ago, you are going to receive the lower price since the company has made the pricing retroactive going back 14-days. If you do qualify for the new pricing, OnePlus wants you to visit Customer Support at https://oneplus.net/support. The part of you that sees good in everyone and everything is telling your mind that OnePlus cut prices so that more people in the world can afford their phones. The dark side of you, which manifests as that devil on your shoulder, is telling you that OnePlus is simply trying to move product and lower inventory just before it unveils the OnePlus 3, which is rumored to take place on June 14th. Once again, OnePlus will be using VR to introduce its new flagship, but this time you will be able to buy the new model from a virtual shop. The Sandstone Black OnePlus 2 with 64GB of storage is now $299. The OnePlus X is $199 in Champagne (the model in Onyx is sold out, as is the OnePlus One). Remember, these are permanent changes, so there is no rush to make a purchase. In fact you might want to wait to see what the OnePlus 3 is all about before picking up one of the older models. that skin on 1st picture looks dope! 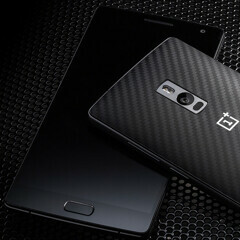 Im pretty sure its a style swap cover not a skin, but yea carbon fibre always looks dope! Why does it have to be the dark side? That's a win-win situation: we get the same phone for cheap, they get to clear stock. Why not report on Cupertino's evil doings?